Thanks guys, I am glad you like the photo's. I ran out of room on the last post some here are the remaining photo's. Here is my version of a true space missile. I call it the A.S.M. short for Anti-Spacecraft Missile. Rocksim simulation need some more work before posting. Here is a close up of the Old Ranger. 7 McDonald's straws fit good into a Bt-20 tube. And finally is a unloaded Six shooter. Neat rockets, James! You might think about getting some Microscale or Bel decal paper and make some simple decals. If you don't have the patience to draw any, you can download the ones on JimZ's or other sites then copy & paste windows, hatches, cockpits, and other stuff that would fit with the theme of the rockets. It wouldn't take much at all to take really cool looking designs and make them even more outstanding. These are two-stage designs for 13mm motors. The design is inspired by the old Estes Farside and Estes Delta models; they are not simple reductions of those designs. Both of these models will provide reasonably good small-field action, gaining less than 700'. All motor combinations reach safe flight velocity on a standard launch rod. I don't think that's in the works, but A10-0T's are still in fairly plentiful supply. There are several on-line vendors who stock them and the prices aren't too bad. And I did mention some time back that I had several of these "what if" ideas for the Schoolyard Sounders series in the works. 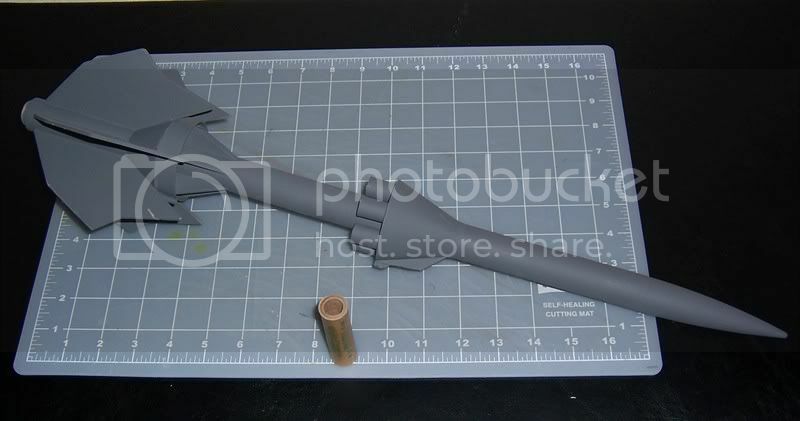 I sometimes enjoy seeing what would be possible "if only..."
With all of the talk about the Orion of late, I thought I might whip up a quick RockSim file on this model, using SEMROC balsa components instead of the original plastic ones from Centuri. What came out was a mixed bag performance-wise. The only safe motor right now to use in this model is the Quest C6Q-5, which allows safe flight velocity in 45", thus requiring a 48" x 3/16" launch rod. The Estes C6-5 takes a whopping 63". When I used the Apogee D10-7, I finally got a set of numbers that fall into safe categories. The model requires only 26" of launch guidance, and deploys at a much milder 23 FPS. The altitude is better at just over 1200'. What I will probably do is revise this plan for 24mm motors and see what I can get closer to safe launch and deploy numbers. Oh Boy, I wish I had rocksim. I hope you will post the results. I'll find a launch date to give you my stats as soon as the paint dries. Never mind, I'll just give it a swing and a launch!!! Here's the 24mm version of the Orion. The changes include a 4" length of ST-9 and a shifting of the first centering ring 1" forward. A longer engine hook and thrust ring round out the mods. 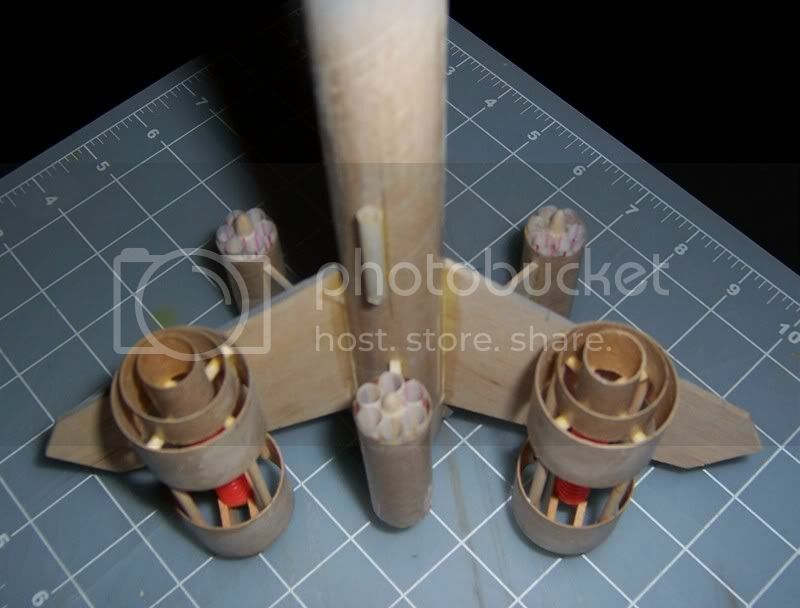 As you can see, the larger motors are much better suited for this model. For the rest of the components, I've used pretty much what you've described. The wrap is probably not to the exact weight, but it's going to be close. Keep in mind, since the original Orion used cut-down Saturn wraps, a SEMROC kit can simply borrow from the S1B kit and be "keeping in spirit", if not spot-on, with that original Centuri kit.